Since hiding or sheltering assets in order to become Medicaid eligible has been much talked about of late, it's worth pointing to a new report by Ellen O'Brien of the Georgetown University Long Term Care Financing Project. The project is funded by the Robert Wood Johnson Foundation. The report, Medicaid's Coverage of Nursing Home Costs: Asset Shelter for the Wealthy or Essential Safety Net? (PDF) emphasizes the "little evidence that nursing home residents transfer assets to gain eligibility for Medicaid." I've long suspected that the scope of the problem does not match the rhetoric around it. And this report is suggestive that that's the case. However, some of the data cited are rather old (the 1989 National Long Term Care Survey) and the 1985 National Nursing Home Survey. And, if there's really no payoff what are all those lawyers advertising for? (Go do a Google search on "Medicaid asset trust" or something similar) and note the number of hits. Other data suggest that some elderly people transfer assets to avoid taxation, but recent changes in the inheritance laws will likely reduce the incentives to do so. But those same data also suggest that while wealthy people in declining health give gifts to avoid taxation, but the less wealthy people hold on to their assets as a precaution. A 1993 study estimated the maximum potential Medicaid savings in nursing home costs was three percent. But that estimate included those who might have transferred assets, but who did not enter a nursing home. Savings estimates associated with state Medicaid waiver applications have been relatively small, the largest being 1.4 percent. As they say, "absence of evidence is not evidence of absence." This report is helpful and it sets a balanced tone, but by no means does it end the argument. Are the upcoming Federal Medicaid cuts that big a deal? Had eight hours in the car yesterday and along with listening to a mystery, I thought a bit more about the upcoming Federal Medicaid cuts of $10 billion. If one can get past the observations that financially the Federal government is out of control and that pervasively Bush's and Congressional priorities favor the wealthy over everyone else, the Medicaid cut number is not that big a deal. Nationally, the Medicaid cuts would total $10 billion over five years. 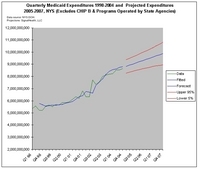 If New York kept its Medicaid spending flat for five years (an unlikely prospect, right? ), all by itself it would spend $450 billion about half of which would be Federal funds. Robert Samuelson points out that with projected national five-year Medicaid spending of over a trillion, the proposed cut is no more than one percent. Symbolically meaningful perhaps, but not much else. Of course, small numbers don't mean that the policy choices won't be stupid. Over five years, the Congressional Budget resolution requires $10 billion in Medicaid cuts. And the National Governor's Association and the National Conference of State Legislators are working away developing proposals to meet the $10 billion goal without taking it out of the hides of the states. Most everybody these days is blaming middle and upper class folks who dump their assets or put them in trust in order to become eligible for Medicaid financed nursing home care. Yet, I can't recall a single article or paper that presents any data on the scope of this problem. They also call for incentives for private long term care insurance. Hey, I thought we'd already done it, but this is a notion that I've always thought was low leverage. So I'm not surprised that whatever incentives we have tried haven't made much of a dent. This coverage is too expensive. Don't ever expect it to make much difference. More importantly, for all the rhetoric, the centerpiece of New York's long-term care policy is nursing homes. Keep people out and even if they require assistance, they will burn up their assets at a much slower pace and Medicaid's cost will be lower. Local share. Newsday notes that "it's good that the state is finally planning to cap the local share, but it must do so in a way that doesn't penalize poorer counties." Nice sentiment, but isn't this a done deal? Seems to me that there would be some real risk for localities if the new cap were re-opened. They might wind up with less than they already got. Well, we'll see what all those folks have to offer. Whatever it is, it's not likely to be pleasant. That's especially so in New York because of the new cap on on the local share of Medicaid costs. We'll cover that extensively later in the week.